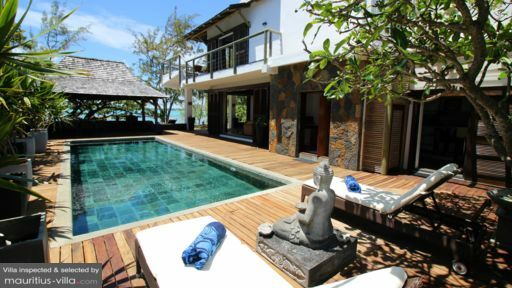 Facing the ocean, Koki Bonheur Beachfront Villa is designed to take advantage of its beachfront location. The villa, with its rustic yet stylish touches and classy urban appointments, was laid out to provide spaces – both outdoor and indoor – where you can fully enjoy spectacular views of the lagoon and Pointe St. Geran. At Koki Bonheur Beachfront Villa, you will truly experience all the elements that make up a fun and unforgettable beach vacation – white sand, crystal-clear blue waters, sunny skies, balmy breeze as well as complete amenities and comfortable accommodations with a seaside ambience. The villa has a total of four bedrooms. A maximum of eight guests can rent the villa in the four bedroom configuration, and a maximum of six guests can rent the villa in the three bedroom configuration. Two of the bedrooms are on the second level and both open out to a long furnished balcony overlooking the ocean. The other two bedrooms are on the ground floor. One of the bedrooms opens out to the covered terrace facing the lagoon. The other bedroom has direct access to the garden. All bedrooms have spacious ensuite bathrooms. At the side of the villa is the 10-meter swimming pool where you can simply jump into when the lagoon is at low tide. Or, if you’re all in the mood for some night swimming. Or, better yet, if you’re throwing a pool party. If you want to get some sun, there are many spots around the villa where you can stretch out and lazily lounge – on pool beds at the wooden deck area, on day beds under the trees looking out to sea, and on beach chairs at the shore. On a covered terrace extending from the main villa is the outdoor living area. On its cushioned couches and chairs you can all comfortably settle as you continue to enjoy relaxing views of the sea. Within the main villa is the indoor living area where you can all gather on the cushioned furnishings for amusing and animated interaction. Housed in a semi-open pavilion between the swimming pool area and the beach is the main dining area with a square dining table and a high table. An alternative dining area with another table is set up on the covered terrace behind the villa. At any of these dining areas you can show off scrumptious meals you yourself prepared at the modern kitchen within the main villa. The kitchen area is provided with a counter with high chairs. This can double as a bar for all kinds of drinks and snacks. On hand to assist you is the villa’s staff composed of two housekeepers who can also double as cooks, a gardener and a maintenance man. The villa also has its very own kayaks which you may use free of charge. 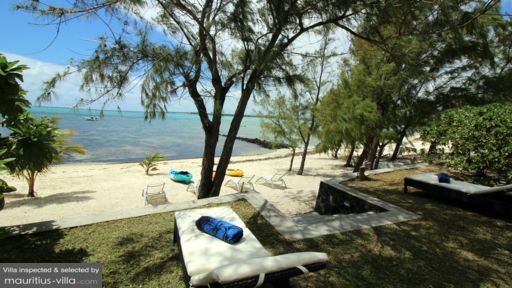 Koki Bonheur Beachfront Villa is located along Jalsa Beach within the village of Poste Lafayette which is situated at the northeastern part of Mauritius. The village is just 30 minutes away from Grand Baie – a large tourist beach known for its traditional local stores and modern shopping centers. 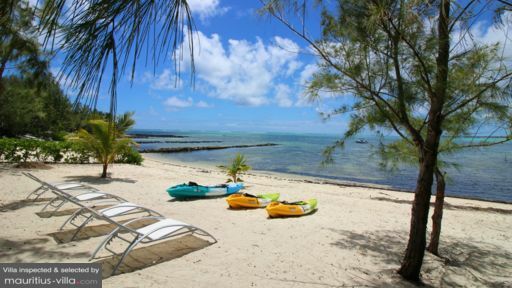 Here, you can also enjoy, aside from swimming, a wide variety of aqua sports and adventures such as deep-sea fishing trips and island-hopping tours – via catamaran – to the northern islands of Coin De Mire and Ile Plate. Make sure you also get to experience Grand Baie’s nightlife. Check out the all-night parties at Banana Cafe, Zanzibar, Les Enfants Terribles and Buddha Bar.